Sermon – Pastor Tim – Conflict-Suffering…Why? Why would it seem like Jesus taught that the world seen from God’s viewpoint is tilted in favor of the oppressed. This teaching emerges in the Sermon on the Mount and other statements of Jesus: the first will be last (Matthew 19:30; Mark 10:31; Luke 13:30), and he who humbles himself will be exalted (Luke 14:11, Luke 18:14). Paul writes in 2 Corinthians 4:7-10, But we have this treasure in earthen vessels, that the excellence of the power may be of God and not of us. 8 We are hard-pressed on every side, yet not crushed; we are perplexed, but not in despair; 9 persecuted, but not forsaken; struck down, but not destroyed— 10 always carrying about in the body the dying of the Lord Jesus, that the life of Jesus also may be manifested in our body. But why would God single out the oppressed for special attention? Could it be the hardships we experience, the trials we face, will teach us that we’re strongest when we’re trusting in God’s grace? Romans 5:1-5, Therefore, having been justified by faith, we have peace with God through our Lord Jesus Christ, 2 through whom also we have access by faith into this grace in which we stand, and rejoice in hope of the glory of God. 3 And not only that, but we also glory in tribulations, knowing that tribulation produces perseverance; 4 and perseverance, character; and character, hope. 5 Now hope does not disappoint, because the love of God has been poured out in our hearts by the Holy Spirit who was given to us. Conflict/suffering helps us realize our urgent need for redemption. Conflict/suffering helps us experience our dependence on God and our interdependence with one another. 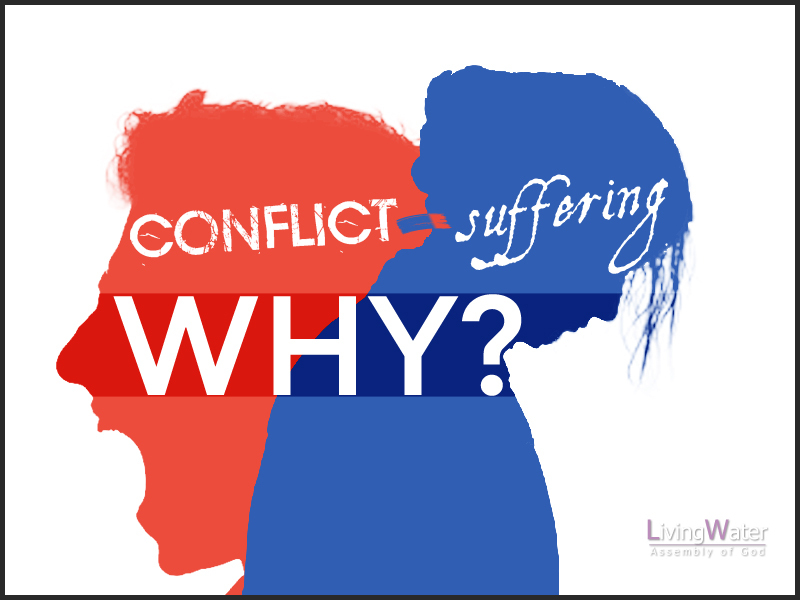 Conflict/suffering helps us distinguish between necessities and luxuries. Conflict/suffering helps us respond to the call of the gospel because we may have become so desperate that we cry out to God. The poor, the hungry, the mourners, and those who suffer are blessed. Matthew 5:3-6, 3 “Blessed are the poor in spirit, For theirs is the kingdom of heaven. 4 Blessed are those who mourn, For they shall be comforted. Could it be that because their lack of self-sufficiency is obvious to them every day? When we are weak we must turn somewhere for strength. People who are rich, successful, and beautiful may go through life relying on their natural gifts. But people who are needy, dependent, and dissatisfied with life are more likely to welcome God’s free gift of love. 3 “Blessed are the poor in spirit”, Why? Because “theirs is the kingdom of heaven. The weaker we feel, the harder we lean on God. I am weak, but He is strong. Why? Because the truth is—life happens. to love my “enemies,” however misunderstood this is; and (6) to pray without ceasing, and in everything give thanks.